Hydroa vacciniforme (HV) is a rare, chronic photodermatosis of unknown origin occurring in childhood. Recurrent vesicles on sun-exposed skin that heal with vacciniform or varioliform scarring characterize HV. The histopathologic features are distinctive and demonstrate intraepidermal reticular degeneration and cellular necrosis. Most cases remit spontaneously by late adolescence. See the image below. Characteristic vesicular lesions occur on sun-exposed skin and heal with varioliform scarring. The frequency of HV varies according to country but is estimated to be around 0.34 case per 100,000 people. The prognosis is excellent; hydroa vacciniforme (HV) typically remits by adolescence. No mortality is associated with classic HV. Patients are advised regarding strict sun avoidance, frequent application of high SPF sunscreens with UV-A blocking agents, and protective clothing. Pahlow Mose A, Fisker N, Clemmensen O, Bygum A. Antiviral treatment of a boy with EBV-associated hydroa vacciniforme. BMJ Case Rep. 2014 Nov 24. 2014:[Medline]. Almeida HL Jr, Kopp J, Jorge VM, Sartori DS, Velloso CD. Extensive hydroa vacciniforme. An Bras Dermatol. 2013 Aug. 88(4):620-2. [Medline]. [Full Text]. Greywal T, Ly M, Wang A, Friedlander SF. Hydroa vacciniforme and granulomatous uveitis in association with EBV. J Am Acad Dermatol. May 2016. 74:AB226. Iwatsuki K, Satoh M, Yamamoto T, Oono T, Morizane S, Ohtsuka M, et al. Pathogenic link between hydroa vacciniforme and Epstein-Barr virus-associated hematologic disorders. Arch Dermatol. 2006 May. 142(5):587-95. [Medline]. Verneuil L, Gouarin S, Comoz F, Agbalika F, Creveuil C, Varna M, et al. Epstein-Barr virus involvement in the pathogenesis of hydroa vacciniforme: an assessment of seven adult patients with long-term follow-up. Br J Dermatol. 2010 Jul. 163 (1):174-82. [Medline]. Halasz CL, Leach EE, Walther RR, Poh-Fitzpatrick MB. Hydroa vacciniforme: induction of lesions with ultraviolet A. J Am Acad Dermatol. 1983 Feb. 8(2):171-6. [Medline]. Annamalai R. Hydroa vacciniforme in three alternate siblings. Arch Dermatol. 1971 Feb. 103(2):224-5. [Medline]. Gupta G, Man I, Kemmett D. Hydroa vacciniforme: A clinical and follow-up study of 17 cases. J Am Acad Dermatol. 2000 Feb. 42 (2 Pt 1):208-13. [Medline]. Nomura H, Suzuki H, Egami S, Yokoyama T, Sugiura M, Tomita K, et al. A patient with elderly-onset atypical hydroa vacciniforme with an indolent clinical course. Br J Dermatol. 2015 Sep. 173 (3):801-5. [Medline]. Yesudian PD, Sharpe GR. Hydroa vacciniforme with oral mucosal involvement. Pediatr Dermatol. 2004 Sep-Oct. 21(5):555-7. [Medline]. Jeng BH, Margolis TP, Chandra NS, McCalmont TH. Ocular findings as a presenting sign of hydroa vacciniforme. Br J Ophthalmol. 2004 Nov. 88(11):1478-9. [Medline]. Wisuthsarewong W, Leenutaphong V, Viravan S. Hydroa vacciniforme with ocular involvement. J Med Assoc Thai. 1998 Oct. 81(10):807-11. [Medline]. Kim WS, Yeo UC, Chun HS, Lee ES. A case of hydroa vacciniforme with unusual ear mutilation. Clin Exp Dermatol. 1998 Mar. 23(2):70-2. [Medline]. Haddad JM, Monroe HR, Hardin J, Diwan AH, Hsu S. Hydroa vacciniforme: a rare photodermatosis. Dermatol Online J. 2014 Aug 17. 20 (8):[Medline]. Iwatsuki K, Ohtsuka M, Akiba H, Kaneko F. Atypical hydroa vacciniforme in childhood: from a smoldering stage to Epstein-Barr virus-associated lymphoid malignancy. J Am Acad Dermatol. 1999 Feb. 40(2 Pt 1):283-4. [Medline]. Iwatsuki K, Ohtsuka M, Harada H, Han G, Kaneko F. Clinicopathologic manifestations of Epstein-Barr virus-associated cutaneous lymphoproliferative disorders. Arch Dermatol. 1997 Sep. 133(9):1081-6. [Medline]. Hirai Y, Yamamoto T, Kimura H, Ito Y, Tsuji K, Miyake T, et al. Hydroa vacciniforme is associated with increased numbers of Epstein-Barr virus-infected γδdT cells. J Invest Dermatol. 2012 May. 132(5):1401-8. [Medline]. Magaña M, Sangüeza P, Gil-Beristain J, Sánchez-Sosa S, Salgado A, Ramón G, et al. Angiocentric cutaneous T-cell lymphoma of childhood (hydroa-like lymphoma): a distinctive type of cutaneous T-cell lymphoma. J Am Acad Dermatol. 1998 Apr. 38(4):574-9. [Medline]. Tokura Y, Ishihara S, Ohshima K, Hidano A, Koide M, Seo N, et al. Severe mosquito bite hypersensitivity, natural killer cell leukaemia, latent or chronic active Epstein-Barr virus infection and hydroa vacciniforme-like eruption. Br J Dermatol. 1998 May. 138(5):905-6. [Medline]. Yamamoto T, Tsuji K, Suzuki D, Morizane S, Iwatsuki K. A novel, noninvasive diagnostic probe for hydroa vacciniforme and related disorders: detection of latency-associated Epstein-Barr virus transcripts in the crusts. J Microbiol Methods. 2007 Feb. 68(2):403-7. [Medline]. Takeuchi T, Kamide R. Severe hydroa vacciniforme-like eruptions confined to sun-exposed areas. J Dermatol. 2011 Apr. 38(4):386-9. [Medline]. Wang M, Wang S, Yang QP, Liu YM, Gao LM, Sun H, et al. Hydroa vacciniforme-like lymphoma of an adult: a case report with review of the literature. Diagn Pathol. 2013 May 1. 8:72. [Medline]. [Full Text]. Sangueza M, Plaza JA. Hydroa vacciniforme-like cutaneous T-cell lymphoma: clinicopathologic and immunohistochemical study of 12 cases. J Am Acad Dermatol. 2013 Jul. 69(1):112-9. [Medline]. Uchiyama M, Tsuboi R, Kusunoki T. A case of recurrent facial herpes simplex mimicking hydroa vacciniforme. Int J Dermatol. 2015 Mar. 54 (3):e84-5. [Medline]. Magaña M, Massone C, Magaña P, Cerroni L. Clinicopathologic Features of Hydroa Vacciniforme-Like Lymphoma: A Series of 9 Patients. Am J Dermatopathol. 2015 Sep 10. [Medline]. Mehta RV, Shenoi SD, Balachandran C, Pai S. Minimal erythema response (MED) to solar simulated irradiation in normal Indian skin. Indian J Dermatol Venereol Leprol. 2004 Sep-Oct. 70 (5):277-9. [Medline]. Levoska MA, Cohen JI, Manoli I, Richard Lee CC, Ching SST, Shand J, et al. 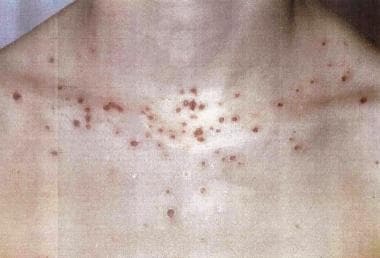 Recurrent scarring papulovesicular lesions on sun-exposed skin in a 22-year-old man. J Am Acad Dermatol. 2018 Mar. 78 (3):637-642. [Medline]. Collins P, Ferguson J. Narrow-band UVB (TL-01) phototherapy: an effective preventative treatment for the photodermatoses. Br J Dermatol. 1995 Jun. 132(6):956-63. [Medline]. Hashizume H, Tokura Y, Oku T, Iwamoto Y, Takigawa M. Photodynamic DNA-breaking activity of serum from patients with various photosensitivity dermatoses. Arch Dermatol Res. 1995. 287(6):586-90. [Medline]. Ziering CL, Rabinowitz LG, Esterly NB. Antimalarials for children: indications, toxicities, and guidelines. J Am Acad Dermatol. 1993 May. 28(5 Pt 1):764-70. [Medline]. Bruderer P, Shahabpour M, Christoffersen S, André J, Ledoux M. Hydroa vacciniforme treated by a combination of beta-carotene and canthaxanthin. Dermatology. 1995. 190(4):343-5. [Medline]. Omenn GS, Goodman GE, Thornquist MD, Balmes J, Cullen MR, Glass A, et al. Effects of a combination of beta carotene and vitamin A on lung cancer and cardiovascular disease. N Engl J Med. 1996 May 2. 334(18):1150-5. [Medline]. The Alpha-Tocopherol, Beta Carotene Cancer Prevention Study Group. The effect of vitamin E and beta carotene on the incidence of lung cancer and other cancers in male smokers. N Engl J Med. 1994 Apr 14. 330(15):1029-35. [Medline]. Blackwell V, McGregor JM, Hawk JL. Hydroa vacciniforme presenting in an adult successfully treated with cyclosporin A. Clin Exp Dermatol. 1998 Mar. 23(2):73-6. [Medline]. Rhodes LE, White SI. Dietary fish oil as a photoprotective agent in hydroa vacciniforme. Br J Dermatol. 1998 Jan. 138(1):173-8. [Medline]. Rhodes LE, Durham BH, Fraser WD, Friedmann PS. Dietary fish oil reduces basal and ultraviolet B-generated PGE2 levels in skin and increases the threshold to provocation of polymorphic light eruption. J Invest Dermatol. 1995 Oct. 105(4):532-5. [Medline]. Durbec F, Reguiaï Z, Léonard F, Pluot M, Bernard P. Efficacy of ?-3 Polyunsaturated Fatty Acids for the Treatment of Refractory Hydroa Vacciniforme. Pediatr Dermatol. 2011 Oct 4. [Medline].